There’s no way on Earth I can fit my appreciation for The Legend of Zelda in a single post. It requires an effort of heroic proportions, but I’m going to try. The Legend of Zelda is a series of video games in which a young hero named Link rescues Princess Zelda from the wicked sorcerer Ganon. The basic plot of most games is simple—Link rescues Zelda and defeats Ganon—but each game embellishes it with beautiful settings, delightful characters and unexpected twists. A few Zelda games reject the classic Link-rescues-Zelda formula for something entirely different, shipwrecking Link on an island or forcing him to relive three days over and over in order to save a town from a nihilistic imp. There are numerous incarnations of Link and Zelda throughout the series, but Ganon is always the same character—like Sauron and Voldemort, he’s one of those villains who refuse to die. Link isn’t a typical adventurer. First of all, he wears a green tunic, a stocking cap and occasionally a pair of white tights: definitely not standard garments for a mighty hero. While he uses some of the usual tools and weapons of the adventurer—sword, shield, bow, arrows and so on—he also uses equipment that’s frankly rather strange: boomerang, bug-catching net, bombs, empty bottles, musical instruments and chickens. Well, to be precise, he uses cuccos, the Zelda equivalent of chickens, which can be used to glide through the air after jumping from a ledge. Link is usually accompanied by a companion: a talkative fairy, a cowardly sea captain, a magical sailboat, a shadow imp or Princess Zelda herself. These companions are helpful for the most part, though some players (myself included) have tried in vain for years to kill Navi, Link’s fairy companion in Ocarina of Time, who shrieks “Hey!” and “Listen!” and “Hello!” and “Watch out!” with irritating frequency. Ocarina of Time, by the way, is the greatest video game ever. It received almost universally perfect scores upon its release about thirteen years ago. Review compiler websites rank it as the highest-reviewed game ever. It tops pretty much every list ever compiled of the best video games ever made. In fact, the Zelda series is probably the most highly-acclaimed video game series of all time. There are too many good things about the Zelda series to fit into a short post, so I’ll highlight just a few more. 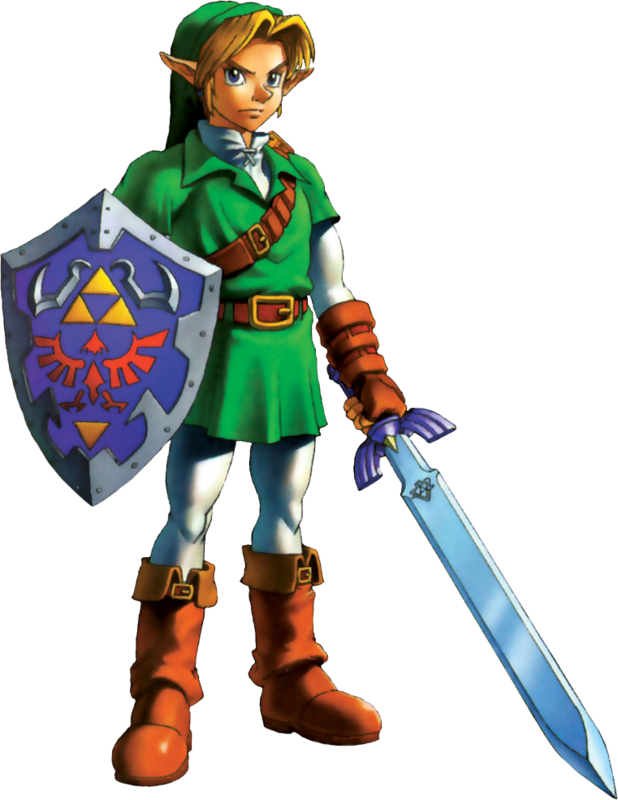 Although Link is a silent protagonist without much personality, the supporting cast and minor characters are typically eccentric, likable and highly memorable. A few of them are also kind of creepy. Mostly this guy. The gameplay of the series is a balanced blend of exploration, combat and puzzles, with a few minigames thrown in for good measure. The games usually feature important treasures for Link to collect, all of which must be gathered to complete the game. Each treasure lies in the heart of a dungeon full of puzzles, traps, locked doors, keys and monsters. At the end of each dungeon lurks a difficult and terrifying enemy, the boss, for Link to conquer in order to claim the dungeon’s treasure. In between dungeons Link is free to roam the land, interacting with people, exploring, earning money, completing optional quests and barging into private homes to break clay pots. The Legend of Zelda is celebrating its twenty-fifth anniversary this year. This is also the year Skyward Sword, the latest Zelda game, is released. It comes out on November 20 for the Nintendo Wii. To say I’m excited for its release is a staggering understatement. My younger brother is also awaiting it eagerly. We’ll be sharing the same copy of the game in December, so I’m not sure how we’re going to work out who gets to play it first. My brother owns several machetes and swords, so I might borrow my old man’s cavalry saber and fight my brother for the right to play Skyward Sword first. We’ll see. My final thoughts about the Zelda series? Play it. If you like video games at all, I can pretty much guarantee you won’t regret it. This entry was posted in Video Games and tagged Legend of Zelda, Nintendo by Adam Stück. Bookmark the permalink. Yay, you’re a fellow Zelda fan! 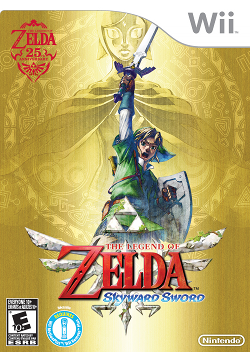 I’m excited about Skyward Sword too, but I probably won’t be buying it very soon after its release. I bought the new 3DS at its US launch after midnight, and the first cartridge game I got for it was The Legend of Zelda: Ocarina of Time 3D. I think it might be a while before I make another investment in a video game-related purchase, but I’m enjoying the opportunity to play an updated version of the best video game of all time! Don’t tell me that I’m being biased (vocab word ^_^) in calling it that. Ah, it’s always nice to find a fellow Zelda fan! My younger brother owns the re-release of Ocarina of Time for the 3DS, so I’m going to borrow it (or steal it, if necessary) over Christmas break. Good use of biased. I award you ten points.